This entry level digital camera takes up to 24 pictures with its on-board memory and can be downloaded into any computer. The MDC100 can also double as a web cam and take short video clips. The product is packaged complete with carrying case, USB cable, software, and instruction manual. Its the Smallest Digital Camera in the world. This fully functioning digital camera is absolutely tiny! It lives on the end of a key-ring chain and is smaller than a matchbox! 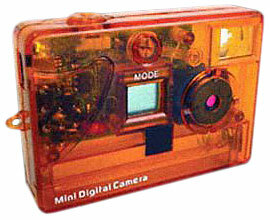 The mini digital camera is simple to use, just point and shoot. You can choose from Low or High resolution and get 20-80 captured shots. Once transferred to your PC, you can store and print the pictures of your choice. One really neat feature of the mini digital camera is it can record short video clips. The included software can then transfer these shots into your own digital movie! Powerful software is supplied to allow you to use the Internet to be face to face with your friends. The world�s smallest mini digital camera comes complete with camera, 1 AAA battery, USB Cable, faux leather carrying case, manual and software.